Hangzhou Railway Station is also known locally as Chengzhan Railway Station. It is 6 miles (10 km) from East Railway Station, 11 miles (18 km) from South Railway Station, 5 miles (8 km) from West Lake and 19 miles (31 km) from Xiaoshan International Airport. First opened in 1999, it is one of the major rail stations in the city, and the largest in Zhejiang Province. Hangzhou Train Station mainly operates regular trains to and from Beijing, Guangzhou, Lanzhou, Zhengzhou, Xi'an and Chongqing. The high speed trains to Shanghai are also available here. Hangzhou Railway Station consists of a terminal building and a square. The 3-storey terminal building connects with a 17-storey multi-purpose building which provides many services including shopping, dining, entertainment and accommodation etc. Bus stops are available on the square. There are cafés and restaurants available such as KFC, Burger King and Daniang Dumplings around the square, too. How to get to the station from downtown area? When arriving by bus, passengers will be dropped off on the elevated square. Ticket holders should enter the station directly to find a seat in the correct waiting room according to the ticket information. For those without, the ticket offices are located at the south and north sides on the same level. Once passengers have obtained their tickets they should proceed to the appropriate waiting room to await their departure. Passengers arriving the station by subway will get off on -2F of the terminal building. There are escalators and lifts leading to upper waiting rooms and ticket offices. When passengers come by taxi, they can go directly to the elevated square outside the entrances on 2F of the station building. From East Railway Station: It takes about 23 minutes and costs around CNY25. From Xiaoshan International Airport: It takes approximately 40 minutes and costs CNY120. From West Lake Scenic Spot (Bai Causeway): It takes 20 minutes or so and costs about CNY25. Before checking-in, passengers should know exactly where to have the tickets checked by reading their tickets and the LED screens carefully. Blue tickets can be handled by automatic ticket checking machines, while pink ones can only be operated manually. Please note that there may be two trains at the platform and be sure to board the correct one. How to exit and leave the station? Upon arrival, passengers will be directed to the arrival hall on -1F to get out from underground passage and then they can choose relevant transportation to leave the station. Subway entrances are on -1F and the subway platforms are on -2F. From the arrival hall passengers can take escalators or stairs leading up to the square at street level. Bus terminals are located on each side of the square. Passengers planning to leave by taxi can find taxi stands on -1F. It is very convenient. 1. Take the bus 7 and get off at Hubin, Shaoniangong or Duanqiao station. 2. Take the bus 290 or 900 and get off at Shengli Theater station. 3. Take the bus Y2, which runs around West Lake, you can get off at the scenic spot of your choice. 4. Take the subway line 1 and get off at Longxiangqiao station. Leave by exit C4 and walk along the Pinghai Road for 250 yards to the lakeside. Subway line 1 will get you there directly. Take the airport shuttle bus from the parking lots in the central of station square. The bus is available between 04:45 and 20:45 at 30 minutes intervals. The journey usually takes about 70 minutes and the fare is CNY 20 per person. There are two ticket offices on the second floor of the station building: one is at the south end, and the other at the north end. The services include ticket purchase, refunds and exchanges as well as ticket loss. There are eleven waiting rooms in total: eight normal waiting rooms and three special waiting rooms for mother & baby, military personnel and soft seat/sleeper ticket holders. The soft seat/sleeper waiting room is on 1F, all the rest are on 2F. The first waiting room on the right side of the waiting hall is for CRH passengers. Luggage lockers can be found in the waiting area; the daily charge is CNY 10 for a small locker and CNY20 for a large locker. There is also a left luggage office near the station exit on 1F, and usually the charge for one piece of luggage is CNY 8-10 per day. 1. There is a China Railway Express near exit on 1F for consigning luggage. 2. On the second floor of the station building, there is a Passenger Service Center providing consulting service. 3. Free WIFI named “SRWS-FREE” is available in the station for passengers’ convenience. I travelled through China in two weeks and I had a wonderful time. Travelchinaguide.com booked my train tickets between Beijing to Pingyao; Pingyao to Xi'an; a flight from Xi'an to Hangzou and a train from Hangzhou to Shanghai. They were extremely fast, effective and responsive during the booking process. We are enthusiastic about your service. Booking was very easy and due to your kind photo and publication of contact datas we had nearly a feeling of individual care. We enjoyed the train journeys and admire the punctuality of the trains. Here in Gemany trains are often delayed. Once again thank you very much for your service. I was extremely happy with the travel services provided by Travel China Guide. They were helpful, extremely prompt in replying to my emails, and their English was excellent. I chose to have my train tickets delivered to my hotel room, and I received them in plenty of time to take my trip. I will definitely use them again next year when I return to China. Five star service! First if all thank you for your help and attention. The trip was great and the procedure was easy and clear. Good service and attention; all trains were in time and arrived at the planned hour. The station signs were clear and helpful and your advices and e-mails help us a lot. Thank you another time. I will highly recomend ypur services to any of my friends and contacts who will visit China in the future. Thank you. Your company's service was excellent and the telephone follow-up for our outbound train to Nanjing helped a lot. We will happily use your service in the future and we will also tell our friends. 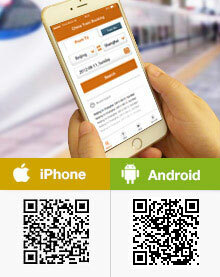 It's easy to travel with travelchinaguide website is easy to use. The answers by mail to our questions are fast and accurate. Just .. one thing .. it's a pity not to be able to print the tickets from. France and to have to go 2 hours before to get them. thank you for all. Everything went very well. The service you provide with the tickets is excellent and the trains and train station is very, very good. I'm completely impressed and will recommend this to everyone I know wants to travel by train in China. Thanks a lot, you did a GREAT Job!!! Would you please kindly guide me the way to go from the station to this hostel? Thank you. If is there any information about the cost by taxi, it would be appreciated. You can use bus No. 7 from the station to botanical garden and then walk about 1.1km to the hostel. Taxi should take around CNY30 and usually around 30min. Would like to go to Hangzhou West Bus station from Shanghai. How to get to the Hangzhou West bus station by train from Shanghai? You can go by rail to reach Hangzhou Station first and then take a taxi to the West Bus Station. Taxi would take around 30 to 40min. The East Railway Station can also be used, just a little far in distance, 40 to 50min by taxi. What's the fastest way from Hangzhou Railway station (not Hangzhou east) to Shanghai Pudong airport? You may consider to take a rail to Shanghai Hongqiao first (as there hardly trains to Shanghai station). Then you can take taxi or metro line 2 or airport shuttle bus to PVG airport. I will touch down in Pudong airport about 3.30pm and take airport bus line 1 to Hongqiao station to Hangzhou.I am staying in Westlake Service apartment at Yuewang Road. Seems like train to hangzhou is limited but nearer to our apartment. But east station has more departures but farther from the apartment. Is travel by taxi expensive? Which station should I choose in term convenient and save time? Secondly , i need to travel to ningbo from hangzhou. Which station should I choose? Indeed your hotel is closer to Hangzhou Station, the main station. It is about 2 stops by metro line 1. But East Station is also not hard for transfer, 6 stops by metro line 1. The cloest metro stop, Longxiangqiao, exit D is about 800m away from the hotel. So East station is also convenient to use. If by taxi, maybe around CNY30. To Ningbo by high speed ride, East station is your only option since all of the rides go from east station. Hi, I am trying to find someplace to store a few bags in Hangzhou for 13 days, while we are out of the country. Will the left luggage service accept bags for such a lengthy amount of time? The left luggage at station is used for short time use. Maybe 2 or 3 days may still work but I am afraid 13 days is too long for this service.